There is a whole new word of online savings that is waiting to come your way. We decode this with a few clicks. The Internet is all pervasive in our lives today. And in the world of smart phones, the Internet is now accessible at your fingertips. With an interconnected world, there is much you can do in using this to your advantage. The extensive penetration of digital media has created a huge potential in the online retail segment, leading a large chunk of the population to shop online. The primary reason for the buyers to adopt this technique is that they can shop anywhere and everywhere within minutes, contradictory to the original brick and mortar method. “In order to enhance their reach, entrepreneurs come up with various online coupons with attractive offers on a range of products, giving the customers a chance to shop at a much discounted price eventually adding to the benefit of the customer. Apart from the online coupons, there are various allied options like, reward programs, seasonal discounts, in app purchase. These allied options eventually sum up to be hugely beneficial,” says Shanky Kumar, Director Ellemora. The world of online coupons and gift cards is a great way to save your hard earned money. This is a concept that has been around for a while, but has recently gained momentum in India. Take a simple example. An Uber ride between point A and point B costs Rs. 150. I had a coupon code that gave me a 40 percent off and as such only ended up paying Rs. 90 saving a cool Rs. 60 by simply applying the promotion in the app before I booked the cab. While this is a small example of daily small savings, there is so much more you can do using online coupons and gift cards. This is especially useful when you are making big ticket purchases where these kind of coupons and discounts come in handy. Website aggregators are another good way that you can use to compare prices of the same item across several web sites as they list in descending order and the web page where the item is available at the lowest price is listed first. So how do you ensure your money works for you in the virtual world? Well, here is your guide on how you can use online coupons and allied options to save money. Subscription: One of the most convenient ways to get promotional and discount codes is by registering on retail websites and subscribing to promotional updates. “Go to a search engine and enter the website name along with the phrase “promotional code” or “coupon code”. This could get you codes of various deals and discounts on different products on that website. All reputed retailers have a presence on social media networks. Subscribe to or like these pages to get regular information regarding discount codes, special sales and other promotions. Having access to discount codes and coupons is not enough. Use these coupons strategically and smartly for maximum benefit and savings. This is vital when availing multiple coupons on the same order. When using more than one code, the target must be to get the maximum possible discount on that particular purchase,” advices E R Ashok Kumar, CEO and Co-founder, Scripbox. Special Sales: Look out for flash sales, special offers that ecommerce portals offer regularly. This is when you can buy that gadget you have been meaning to for a while but putting away because of its high cost. In fact also keep an eye out for special discounts offered during specific times in the day where you get an additional amount off. Gift Cards: Leading brands and retailers have launched a slew of options for the festive season that enables consumers across India to save between 5% – 25% across their purchases via gift cards. “The top 150 brands in India have launched their festive Gift Card collection – that is very relevant for consumers. 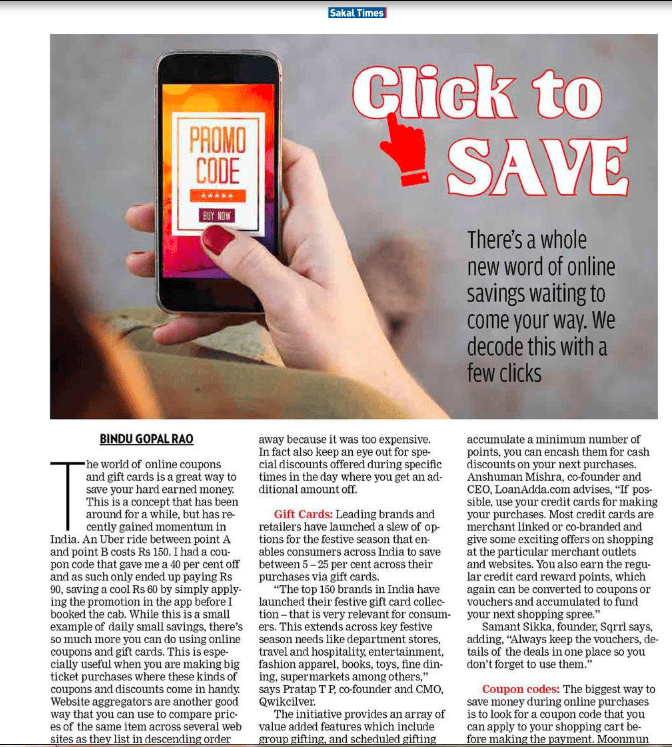 The options of Gift Cards available for consumers extends across key festive season needs like department stores, travel & hospitality, entertainment, fashion apparel, Books & toys, fine dining, supermarkets among others,” says Pratap, Co-Founder & CMO, Qwikcilver. The initiative provides an array of value added features which include group gifting, and scheduled gifting amongst others. Consumers can also avail reward points for transactions on gift cards purchased online and through the Woohoo app. Pre-bookings: Women these days take a lot of solo trips, for which they can pre-book their traveling tickets, stays in a hotel and cab rides. “Pre-booking assures the deliveries on time which make it a hassle-free experience for the consumers especially women as their safety is taken care of which is the most important thing today, also pre-bookings gives lots of discounts on orders which helps in saving extra bucks, and who doesn’t like to save,” avers Swati Nathani, Chief Business Officer, Team Pumpkin.